Bedlam is a 2013 novel by Christopher Brookmyre about gamers who end up trapped inside a videogame, which as it turns out is not as much fun as it might seem. It's also an actual video game that hit Steam Early Access last August. Today, developer RedBedlam announced that it will launch this coming August, and with that month rapidly approaching, released a gameplay trailer that I think looks like a lot of fun. 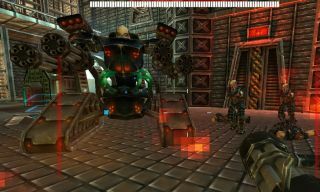 Bedlam is played as Heather "Athena" Quinn, an overworked, underpaid scientist for corporate monolith Neurosphere who volunteers as a test candidate for a new brain scanning technique. But something goes awry, and somehow the scan traps her in the world of Starfire, a violent videogame she spent hours playing as a teenager. "A shooter for those who survived online gaming in the 80s and 90s, Bedlam takes a look through an iconic time in online gaming and serves up some authentic gaming nostalgia with up-to-date graphics and gaming features," the Early Access page states. "Bedlam is set entirely in the first-person but will explore other game genres from a first-person perspective." It looks silly, but in a good way, and as someone who 'survived' gaming in that era, I dig the references to Pac Man, Defender, and Space Invaders as much as I do the more modern, Unreal-style stuff. Bedlam is set to come out on August 13.